Knee Replacement (also known as Knee Resurfacing or Knee Arthroplasty), is an orthopaedic surgical procedure for knee arthritis in which the worn out cartilage of the knee joint is resurfaced with prosthetic components. The muscles and side (collateral) ligaments of the knee are preserved. Resurfacing the worn out knee cartilage with a smooth prosthesis that matches the shape of the bone allows the knee joint to move and function more normally again. Mr Freedman performs Patient-Specific Knee Replacement and computer guided knee replacement procedures using a range of different prostheses. Depending on patient circumstances, a cruciate-retaining, posterior stabilised or medial pivot implant may be recommended. Mr Freedman will evaluate your knee and advise as to the best option for your knee. (1) What are the benefits of a Total Knee Replacement / Resurfacing / Arthroplasty (TKR)? A rapid and significant reduction (if not total elimination of) knee pain. Recovery of mobility – your knee will move smoothly again and will function more normally. Improvement in quality of life – Everyday activities such as walking and bending your knee will no longer be limited by pain and restricted mobility. (2) What type of anaesthetic will I have for a knee replacement? In general there are two types of anaesthesia: (i) General Anaesthetic (where patient is deeply asleep) and (ii) Regional Anaesthetic (epidural or spinal) where only the operative leg is put to sleep (by way of an injection). To gain the “best of both worlds” and provide of the most pleasant and safest anaesthetic our practice often prefers a combination technique in which a patient received a spinal anaesthetic but also general sedation. This allows our patients to gain all the benefits of a spinal or epidural (less pain, less pain killers, less bleeding during surgery) but also to be sleepy and thereby not aware of surgical proceedings, while avoiding the need for breathing machines and deep general anaesthetic. Your anaesthetist will talk with you before the procedure to clarify exactly what anaesthetic will be used and the associated recovery after that anaesthesia. You will first receive an anaesthetic so that the operation can be performed safely and with no pain. This is usually a combination spinal/sedation anaesthetic (see above). An incision of about 12cm is then made over the front of the knee. The main knee tendon (quadriceps and patella tendon) is then moved to the side and the surfaces of the knee joint are then exposed. The edges of the damaged cartilage are cleared and the underlying surfaces are prepared for implantation of the prostheses. Advanced computer technology and patient-specific instruments are utilised to ensure that the implants are positioned accurately. Once the implants are appropriately positioned and fixed in position the incision is carefully closed and your rehabilitation begins. Mr Freedman endeavours to achieve a rapid recovery from surgery. Most of out patients are able to stand as soon as the anaesthetic wears off, commence walking by day 1 and are able to be discharged after 2 days in hospital. (4) Who is suitable for a Knee Replacement? Patients with moderate to severe arthritis who cannot adequately manage their symptoms through other conservative means are generally candidates for knee replacement (TKR). Patients are usually encouraged to try simple non-operative measures such as weight loss, simple pain killers and ant-inflammatories, physiotherapy and activity modification before undergoing surgery. If, despite non-operative treatment, you still have a painful and/or stiff knee that interferes with your quality of life and daily activities, you may be a candidate for surgery. To assess your knee Mr Freedman will take a careful clinical history, examine your knee, and study X-rays and other imaging (if required) of your knee assessment of your knee. He may then recommend total knee replacement. (5) I am concerned by the idea of a “total replacement”. What exactly is replaced in the operation? The terminology here is unfortunately confusing for patients! In knee replacement/resurfacing approximately 9mm of bone (i.e. less than 1cm) is removed from the end of the femur (thigh bone). Between 2mm and 9mm is removed from the end of the tibia (leg) bone bone (again less than 1cm). The muscles of the knee and collateral ligaments (side ligaments of the knee) are completely preserved. It is called a total replacement because all of the cartilage surface of the knee is covered with a new surface. Total Knee Arthroplasty involves places a new surface onto the lower end of the thigh (femur) bone and onto the top end of the tibia (leg bone). In some, but not all cases, a new lining will also be placed on the under surface of the knee cap (patella). The femoral prosthesis is made of an advanced metal alloy. It has a special groove in it to allow for movement of the knee cap over the front of the knee. The tibial component consists of two parts: a metal prosthesis that is fixed to the tibia and then a sophisticated polyethylene liner that secures into the tibial component. If required, the patella (knee cap) component is also made from polyethylene. There are multiple different implant designs and manufacturers on the market. 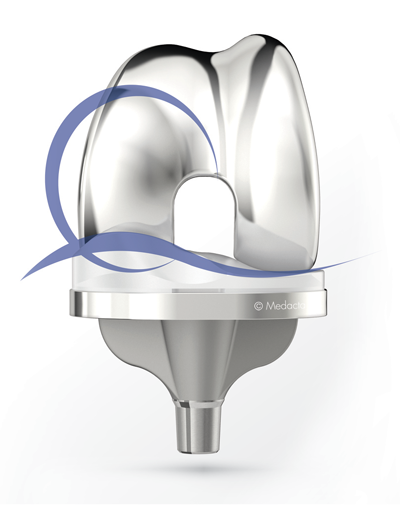 Mr Freedman uses top-of-the line implants that are engineered and manufactured to the highest standards in Switzerland. (7) Will I have much pain after this surgery? Surgeons and anaesthetists have made major advances in recent years in regard to eliminating or at least substantially reducing discomfort from surgery. A “multimodal” (multiple simultaneously combined techniques) will be utilised to turn off pain pathways prior to surgery and to then keep you comfortable during your recovery. Additionally, a fine tube is placed in the knee through which additional local anaesthetic will be infused into you knee in the days after surgery. You may still experience some mild discomfort but our patients can generally stand and walk within hours of surgery and usually report than any discomfort is very manageable and that the procedure is well tolerated. (8) What happens after the surgery? Many of Mr Freedman’s patients are then able to be discharged directly home, with follow up by an outpatient home visiting physiotherapy service. Some older of frailer patients may need a short period of inpatient rehab. Over the first two weeks post op your activities will usually be limited but you will be able to walk short distances independently. Over the next few weeks you will gradually be able to increase your activities. Patients typically return to driving by about 4 weeks post op. (9) How will I be followed up after surgery? For patient convenience we will usually organise for a home-visit physiotherapist to visit you at your home a day or two after your discharge from hospital. Mr Freedman will typically see you 10-14 days after your surgery. Mr Freedman tends to utilise absorbable sutures so that you wont need to have any sutures removed. However, he does like to check that your wound ie healing nicely and that your recovery is proceeding well. He will then see you at 6 weeks after surgery and then after that for any follow ups as required. (10) What are the risks and potential complications? The vasty majority of patients who have TKA surgery are delighted with the improvement in quality of life and reduction in pain that they experience. There are, however, a number of potential complications. These are rare and the vast majority of patients do not experience complications with their recovery. The potential complications include: risk of infection (< 1%), blood clots, bleeding, blood vessel or nerve injury, loosening of the implants over time and failure of the procedure to relieve pain. Numerous measures are taken to reduce the risk of complications. For example, antibiotics are administered to reduce the risk of infection, advanced computer technology is used to achieve accurate alignment of the implants, and great attention is given to pain management to allow patients to mobilise very soon after surgery, thereby greatly reducing the risk of blood clots. The risks/benefits of surgery will be discussed with you in detail prior to obtaining “informed consent” for surgery and you will have opportunity to ask questions and to have these answered to your satisfaction.